The combination of the finest materials and simple elegance are delighting more and more enthusiasts of modern garden design. 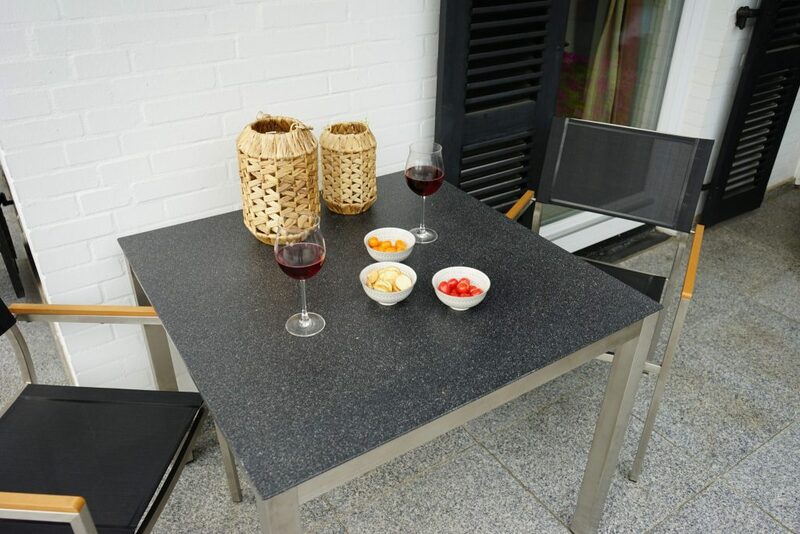 Ceramic tabletops with a concrete finish, glass tops with a stone finish and weatherproof HPL boards, as well as easy-to-use stainless steel frames. 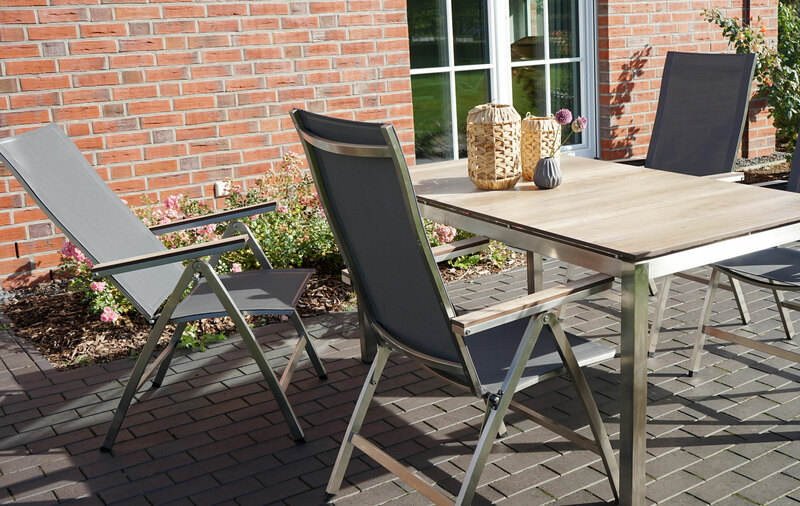 It is thanks to features like these that garden furniture from Ploß®’s stainless steel/aluminium-textiline range are classy, weatherproof and durable companions for outdoor use. The perfect look of these works of art gives this furniture a special design vocabulary. Nowadays, a lot of garden furniture is no longer made of wood or plastic. 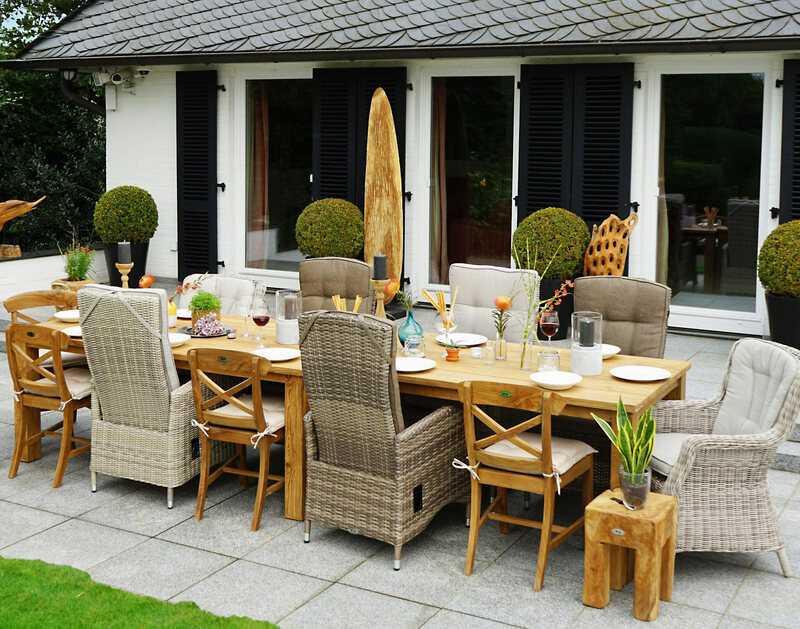 Consumers are offered a much wider selection, both in terms of the materials and of the design of their garden furniture. Often, it does not consist of a single material but of several. Armrests and frames are often made of stainless steel or aluminium, while the seats and backs are made of outdoor weave. Garden furniture made of stainless steel and aluminium has a timeless and beautiful look and is becoming increasingly popular among garden lovers. There are many reasons for this. Aside from its attractive design, such garden furniture is robust and at the same time classy. Compared with wooden furniture, it also requires less maintenance, and it lasts a very long time. By using specific polish stainless steel can attain new brilliancy. Which material you prefer for you garden furniture is primarily a matter of your personal taste. High-quality furniture can be found both among wooden furniture and furniture with a stainless steel or aluminium frames. Wooden furniture is substantially heavier than aluminium or stainless steel furniture, making it more cumbersome to transport. This means that furniture with arm- and backrests made of aluminium or stainless steel is very easy to look after, as well as being weatherproof. Also, even garden furniture that is not made of wood looks classy and natural, these days, making it a genuine alternative to wood. Almost every type of furniture that is made of wood is now also available made from alternative materials, and its low maintenance and durability means such furniture is becoming increasingly popular. A clear advantage of furniture with an outdoor weave is that it does not need cushions. Furniture made only of wood, on the other hand, will mostly be used with cushions for increased comfort. The frames of garden furniture are usually made of stainless steel or aluminium. Stainless steel generally means any form of steel that does not rust. This is very important in garden furniture so that you can derive years of pleasure from your garden furniture without it being corroded by rust. Another alternative to this is stainless steel-textile garden furniture. Here the stainless steel frame is covered with textiles that are easy to clean, and form the seat. This combination ensures a high degree of comfort too. Furniture made of stainless steel is usually heavier than furniture made of aluminium – yet lighter than wooden furniture. 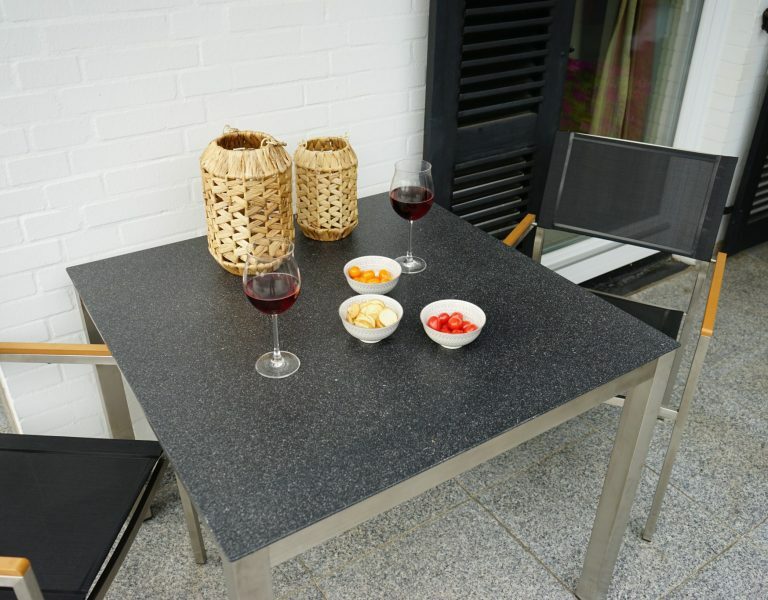 Thanks to its low weight, garden furniture made out of aluminium is easy to move from place to place. Cleaning it is straightforward, using a mild detergent or water. Fitted with additional cushions, the comfort of this modern garden furniture is even further enhanced. It is important to clean garden furniture regularly to ensure it remains attractive for a long time. Light soiling can best be removed using a cloth and clear water. For heavier soiling, a mild detergent may also be used, though this is not often necessary. If possible, however, you should not allow dirt to dry in place, otherwise the furniture becomes more of an effort to clean. Aluminium and stainless steel furniture should be stored in dry, protected conditions over the winter. Low temperatures are not a problem, so a dry garage or dry cellar is perfectly adequate. Being environmentally friendly is often a major criterion when buying garden furniture, as are potential health risks due to metals. The latter concern is unfounded, however, since the aluminium of the chairs cannot be absorbed through the skin. Despite many discussions about the effects of aluminium on the human body, you have nothing to worry about in this respect with your garden furniture. The eco-friendliness of wood, aluminium and stainless steel themselves is more complicated. Wood is not essentially critical, because it is a renewable resource and one that is fully degradable. However, it is important to make sure that the wood comes from certified forestry management. That way you can be sure that your wooden furniture comes from an ecologically responsible source. In the case of aluminium and stainless steel, on the other hand, environmental compatibility is closely linked to the way it is disposed of at the end of its life. When disposing of your furniture, you should therefore be sure to take it to a recycling centre. If the furniture is disposed of properly, the fabrics can be re-used, leading to much greater eco-friendliness than in the case of improper disposal. For this reason, you yourself can contribute to the eco-friendliness of such furniture by disposing of it correctly. In any case, high-quality furniture from our range is an excellent choice and allows you to upgrade your garden.